With the customer at the centre of the process, these handcrafted shoes are directed toward those who, for one reason or another, cannot find a solution in standard mass produced footwear, or who desire exclusivity or added comfort on a pair of shoes. Based on any Klaveness style or customers own designs, they can be designed for the difficult-to-fit foot or to accommodate mild or severe foot deformities. 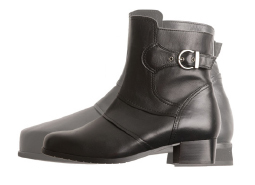 Each shoe is built according to taste, shape, size, adjustability or any other need, without neglecting style. We are the most skilled to blend in these modifications so that they are discreet. On the Comfort, Medical or Rehabilitation sections of this website, as well as in the Individual Footwear catalogue and leaflet, you can find suggested styles in a vast range of material and colour combinations, and soles. Whether you aim for a bolder or classic pair of shoes, please contact your local orthopaedic clinic and discover the best solution Klaveness can offer. 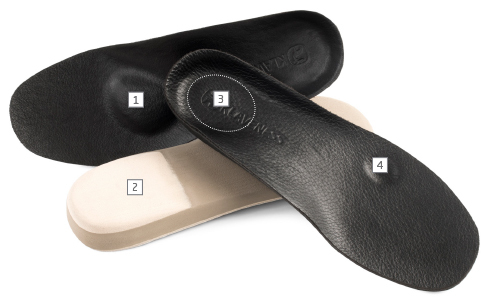 Custom-made foot orthotics are made to increase comfort or to manage conditions that cause pain or discomfort during everyday activities, since they will properly support a larger area and provide cushioning to the foot. Each foot orthotic is individually made to ensure a perfect fit regardless of shape or differences between the left and the right foot. Combined with appropriate footwear, they can be useful in treating foot problems. All Klaveness shoes are designed to offer extra volume, so they can comfortably accommodate custom-made foot orthotics. Always make sure to discuss your options with a trained orthopaedic clinician.